No matter how you spell it, Maine’s Somes Sound may well be the highlight of your summer cruising schedule. Somes Sound—the only fjord on the east coast of the U.S.—almost splits Maine’s Mount Desert Island in half, providing a unique, protected and enormously appealing cruising destination. Way up in Maine, close to the bustling summer resort of Bar Harbor, Somes Sound is a long way to go for most cruisers. But once you’re there you’re bound to agree that it’s well worth the trip not only for cruising in the sound itself—some of the most beautiful, unspoiled surroundings on the entire east coast—but also because of the extra benefits it offers. 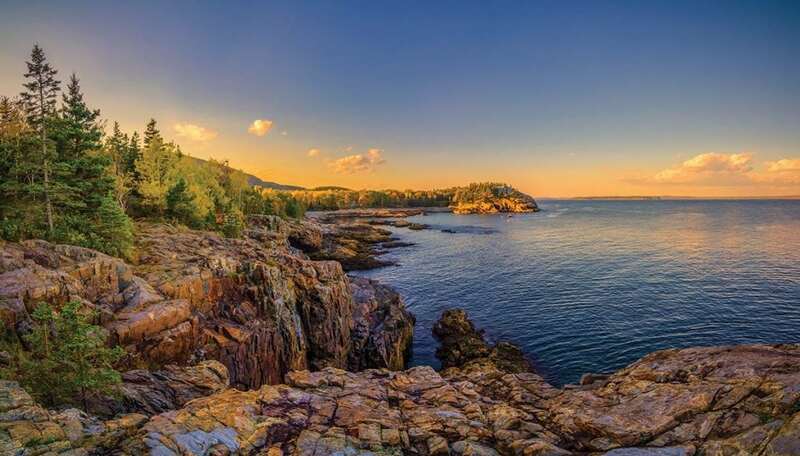 Somes Sound is next to Acadia National Park, with 55 miles of hiking, biking and even horse-carriage trails, and two quintessential Down East towns flank it—Southwest Harbor on the near side and Northeast Harbor on the far. For summer cruisers exploring the Northeast, Somes Sound is an ideal final destination before turning around and heading back south, particularly in late summer and early fall when there’s generally less fog than in June and July. From the popular ports of Rockland and Camden, follow the east shore of Penobscot Bay and turn down Eggemoggin Reach, a classic Maine cruise in its own right. Then head over to Bass Harbor at the tip of Mount Desert Island. Follow the peninsula up about 7.5 miles and you’ll find a wide-open approach to Southwest Harbor. In many ways, the Mount Desert Island area is a step back in time. For the first half of the last century it was a favorite summer vacation destination for wealthy families from New York and Philadelphia. Indeed, John D. Rockefeller had a summer “cottage” there and built the carriage trails in Acadia National Park from 1913 to 1940. And with its one main street lined with small boutiques and galleries, Southwest Harbor (year-round population of 1,764) hearkens back to a kinder, gentler era. But Southwest Harbor is also home to a working lobster fleet and is the birthplace of such iconic Down East brands as Jarvis Newman, Wilbur, Ellis, and Hinckley, with John Williams and Morris nearby. On the north side of the harbor you’ll find half a dozen town moorings and Beal’s Lobster Pier, a working lobster pier with a gas and diesel fuel dock, and a seafood restaurant with picnic tables at the end of the pier. Tie up at the small dock there if you’re eating at Beal’s; they will also deliver fresh seafood to your boat. For more formal dining, Red Sky is back toward the village. It offers fresh seafood but specializes in local organic produce. Don’t bother dressing up for Red Sky—this is Maine, after all, and you’re welcome to come straight from your boat. At the far side of Southwest Harbor just around Clark’s Point leading to Somes Sound, you’ll find the Claremont Hotel, a six-acre waterfront resort that first opened in 1884. The Claremont offers gourmet dining in its Xanthus restaurant, with water views from every table. The Claremont’s Boathouse restaurant directly on the water is more casual. And then there’s Somes Sound itself, formed about 14,000 years ago as the last glaciers retreated. Indeed, large boulders deposited by the melting ice sheet mark The Narrows, the entrance to the sound just above Southwest Harbor. About four miles long and often 150 feet deep, the sound is overlooked by Cadillac Mountain—the highest point on the Eastern seaboard at 1,530 feet. Apparently there is some dispute whether Somes Sound actually qualifies as a fjord, since it doesn’t have the extremely high side cliffs associated with Norwegian fjords. Consequently, it is now often called a fjard, meaning a drowned glacial bay. Either way, the place is beautiful and the vistas are unique. Cruising the sound, you’ll see few signs of human habitation since much of it is next to the national park—it feels as if you’re cruising in a wilderness, miles from civilization. There are some signs of life, however. About halfway up on the left side, the John Williams Boat Company—which still makes elegant Down East style boats—has guest moorings in front of its yard. Their motto, which seems perfect for the setting, is simply “No corporate culture. No dealer incentives. No focus groups. Just boats.” And beautiful boats, at that. When you’re through exploring Somes Sound, make a broad left turn and head into Northeast Harbor. (It’s only about two miles across from Southwest Harbor on a direct route). At this point you’re entering Maine as it was generations ago. Northeast Harbor is smaller, more peaceful and even more protected than Southwest Harbor, and the little village has fewer tourists. Entering the harbor, Clifton Dock is on the left, with a fuel dock (gas and diesel) and some moorings. Just a bit farther is Northeast Harbor Marina with 56 slips, 70 moorings, 30-, 50- and 100-amp service, and dock space for a 220-foot yacht. Next to the marina, the Watermark Restaurant and Lounge at the Kimball Terrace Inn offers bistro-style food, local beer and a great view. For a spectacular harbor view, as well as a taste of turn-of-the-century Maine, try the Asticou Inn at the head of the harbor. The classic summer resort has been there since 1882. Peabody’s, the Asticou’s elegant restaurant, is open for breakfast, lunch and dinner. The Asticou Azalea Garden across the road from the inn and the Thuya Gardens just up the road are owned and maintained by the Mount Desert Land and Garden Preserve. They both have beautiful gardens and terraces, while the Thuya Gardens provide a panoramic view of the harbor. A public landing and dinghy dock at the head of the harbor leads to the gardens and miles of hiking trails. The easiest way to get around all of Mount Desert Island, however, is to hop on one of the free, propane-powered Island Explorer Shuttle buses. They have stops just a short walk from the marinas in Southwest Harbor and Northeast Harbor, and go all around the island, including the national park and Bar Harbor. Make note of your favorites, as you’ll most likely be back next summer, and probably the summer after that.